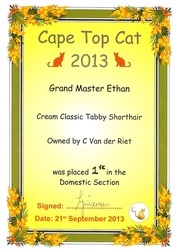 "Grand Master" Ethan won Best Domestic at Cape Top Cat. 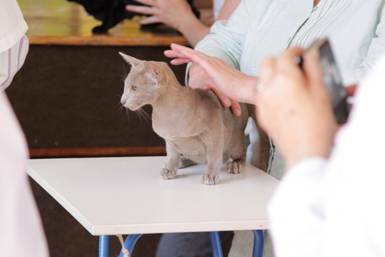 The event was held at Pinelands Presbyterian Church Hall and all the finalists were judged by All Breeds judges Jane Slabbert and Dr Kim Cutter. Ethan had stiff competition and beat his sister "Grand Master" Pixie who came 4th. 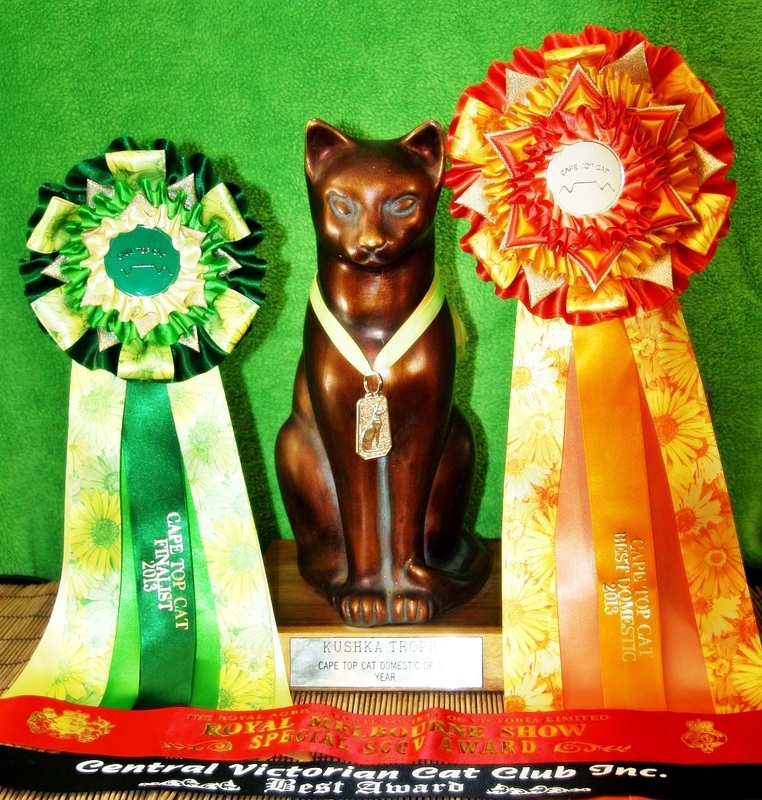 Thanks to the all the judges for awarding both Ethan and Pixie who are both Grand Masters and both managed to qualify for this prestigious event. 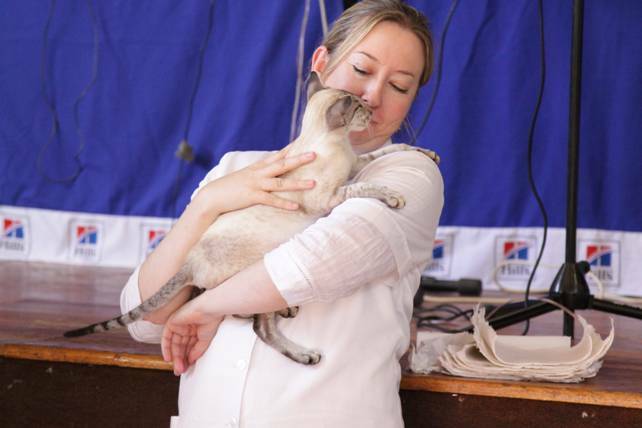 I had fun showing the "doms" this year but it is time to retire them from the show bench and focus on breeding show quality Siamese and Orientals ;-) And no - I won't start breeding domestics! 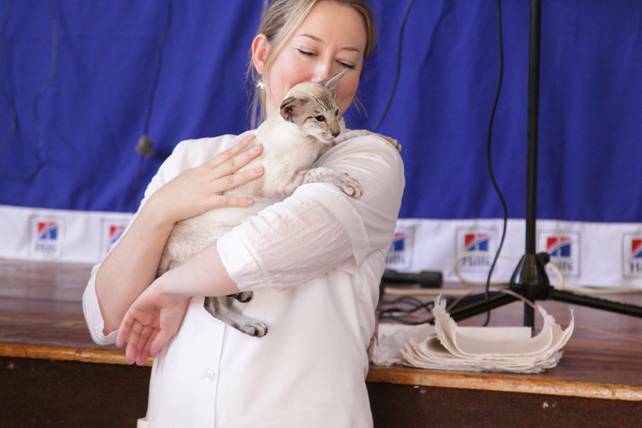 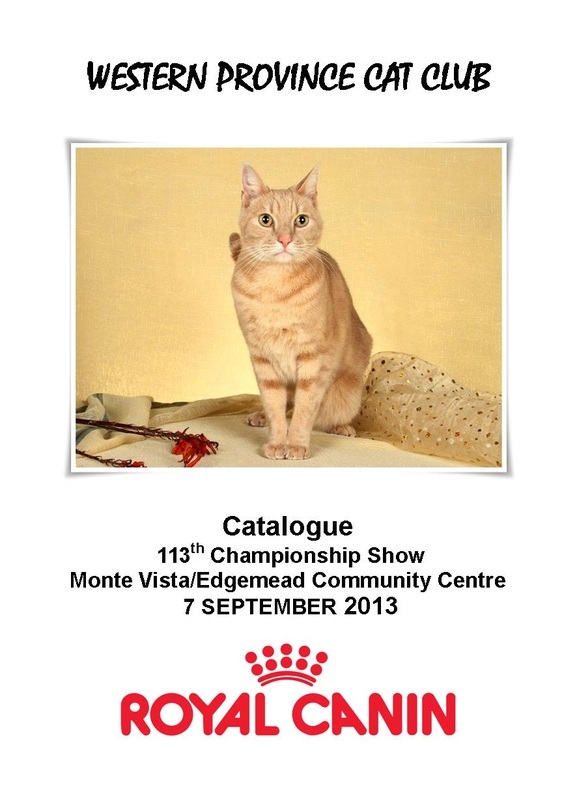 Western Province Cat Club held the last show of the year at the Monte Vista/Edgemead Community Centre. 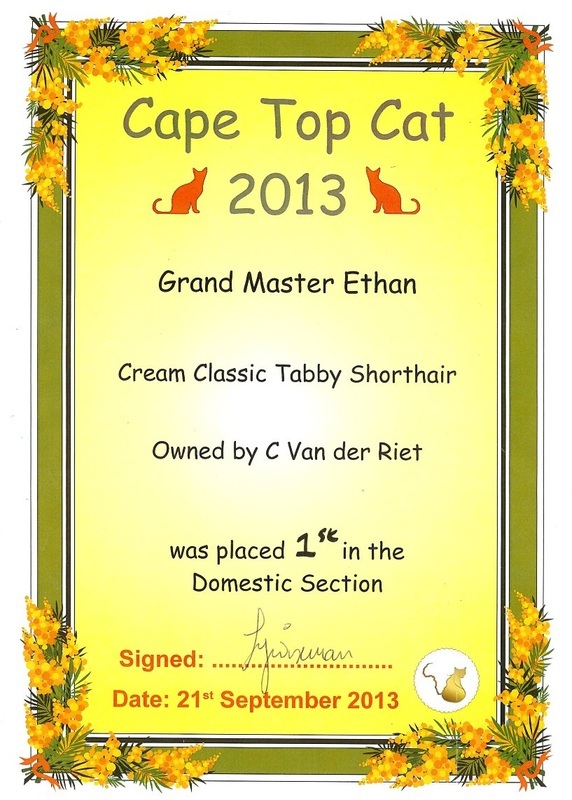 "Grand Master" Ethan got a Master certificate from judge Charlene Du Toit (Thanks Charlene) and qualified on top of the list of 5 Domestics for Cape Top Cat along with his "sister" "Master" Pixie in second spot. 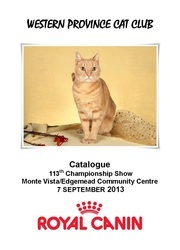 Ethan also made it on the cover of the show catalogue! 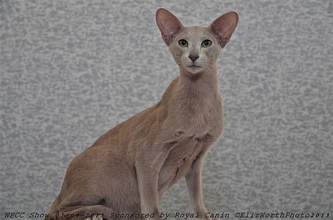 Pr Mai-Thai's Take That aka "Robbie" was Best on Show Neuter Qualifier (top 5 neuters on show), Best Oriental Neuter and got all 3 of his Grand Certificates. 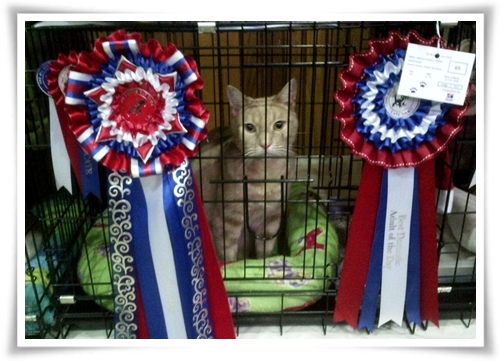 Congrats Charlene! 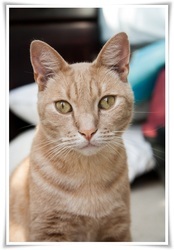 He was looking awesome yesterday! 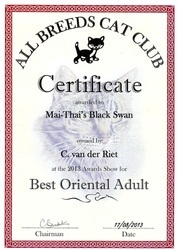 Ch Mai-Thai's Black Swan was Best Oriental Adult on show and got all 3 of her Grand certificates. Mai-Thai's Spot On attended her second show and got a good report from judge Jane Slabbert. 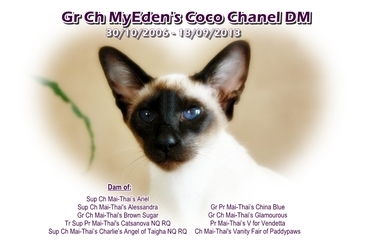 Pr Mai-Thai's Born to be Wild also got all 3 of her Grand certificates. Well done Carol! Pr Mai-Thai's Bad Boy Blue lived up to his name and came second to his brother Robbie. 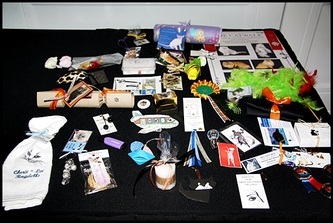 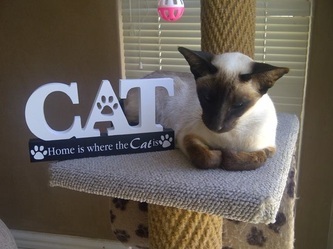 Thanks Michelle Bolton for showing him! 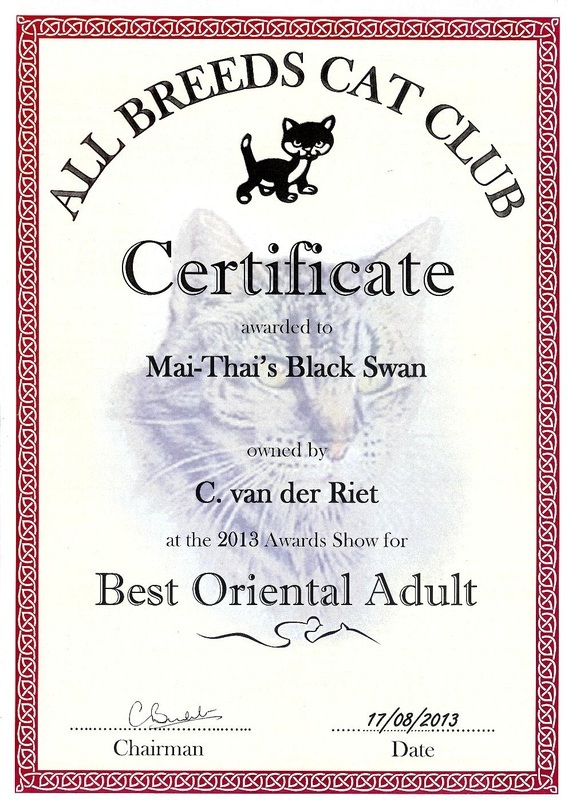 Mai-Thai's Black Swan is now a Champion. 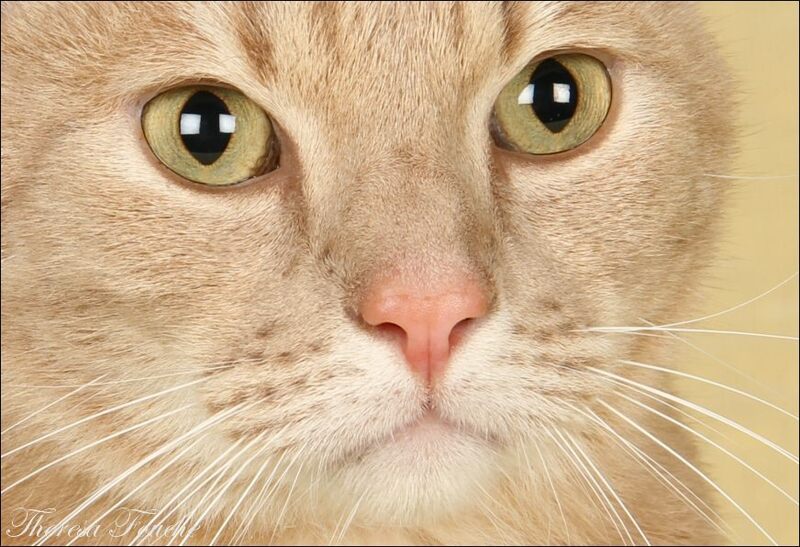 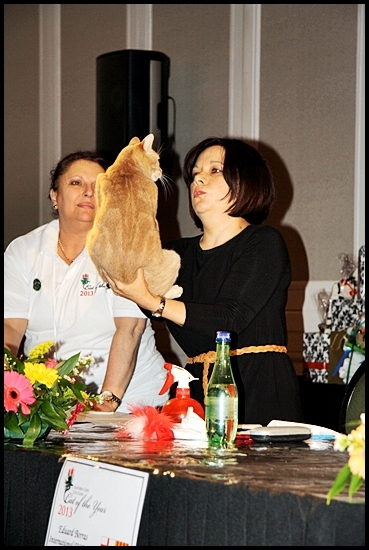 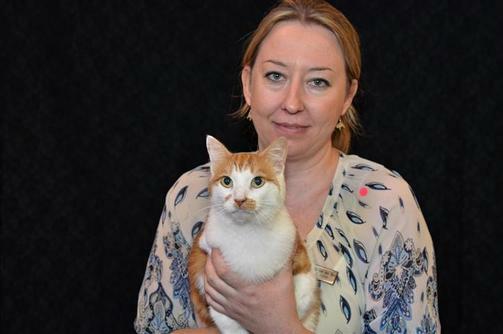 She gained her title on her first Adult show at the All Breeds Cat Club Championship Show on 17 August 2013. 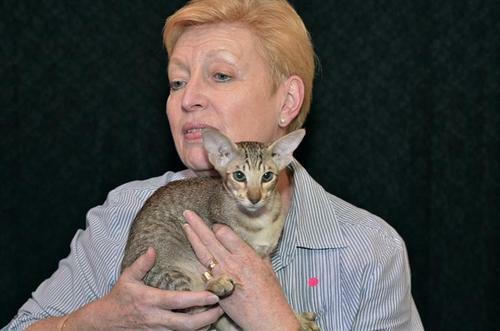 She went on to be judged top 5 Best Adults on Show. 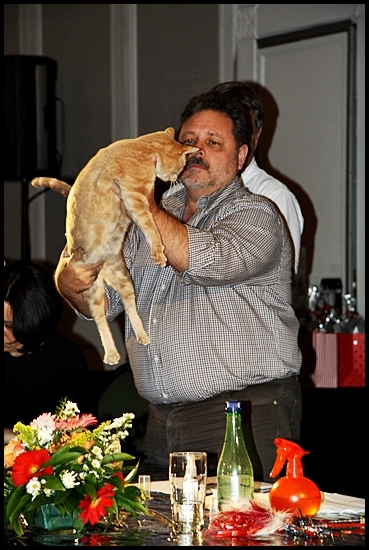 I was very proud to accept her award for Best Oriental Adult on show at the joint WPCC & ABCC Prize-Giving after the show. Her sister, Mai-Thai's Born To Be Wild, owned by Carol Winder, gained her Premier title and was judged Best Oriental Neuter on show. Congratulations Carol! 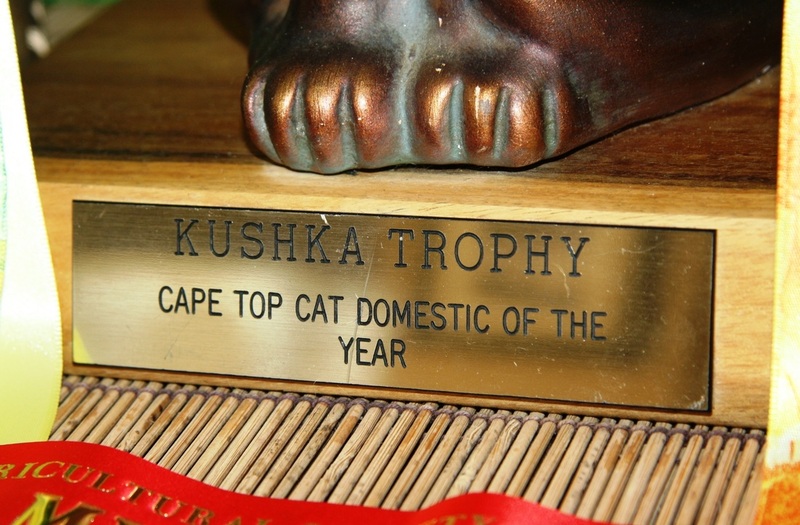 Am very proud of Mai-Thai's Take That, owned by Charlene Du Toit, and Mai-Thai's Bad Boy Blue, owned by Michelle Bolton, who both gained their Premier titles on show. 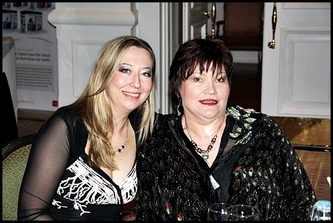 Well done Charlene and Michelle! 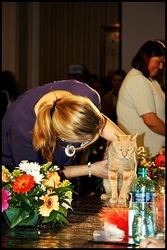 I attended Cat of the Year this year with a Domestic for the first time! The show was held at The Boardwalk International Conference Centre in Port Elizabeth. 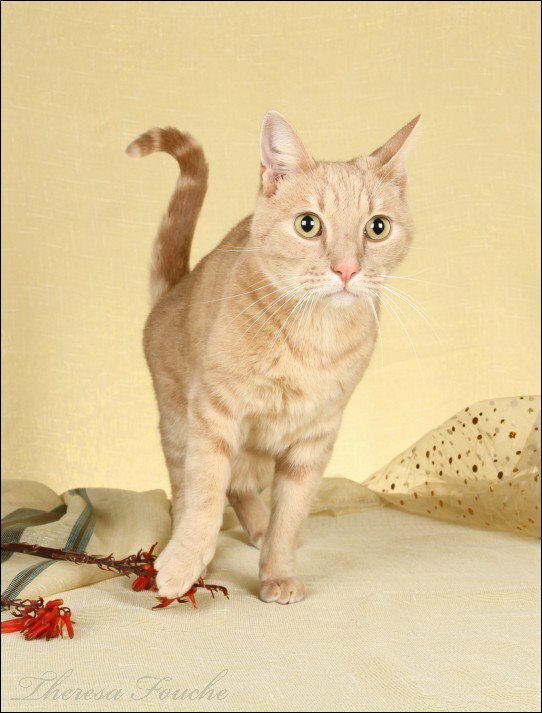 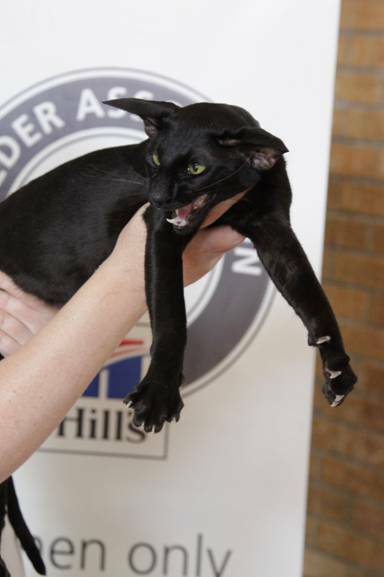 There were 8 Household pet finalists from all over South Africa and he was the only one from Cape Town and the only tabby self. 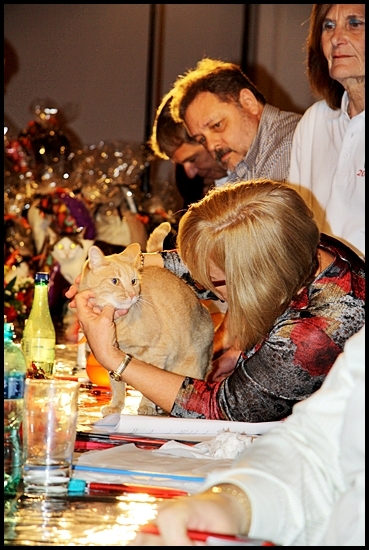 The judges look for a well groomed cat in good health so Ethan was bathed a couple of days before the show. Nails trimmed, coat brushed, ears, eyes and nose cleaned. Ethan is usually a purr-machine at home but getting him to purr for the judges was a real challenge. The show hall was rather full of visiting public and I had to make my way to the judging tables with him in arm. Poor Ethan almost jumped off the table when the one judge waved a teaser in his face! 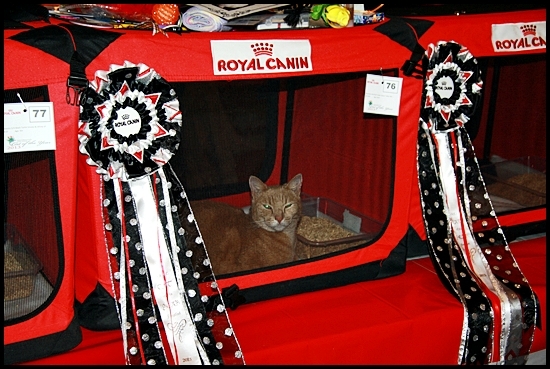 He is not one for playing with toys so this was all new to him and having never stewarded him for other judges a first for me to see his reaction! 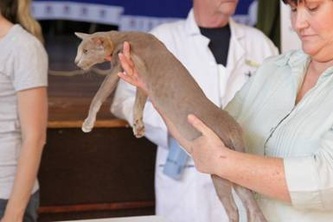 The judging was soon over and the anxious wait for the results began. After judging I took Ethan to Theresa Fouche for photo's. 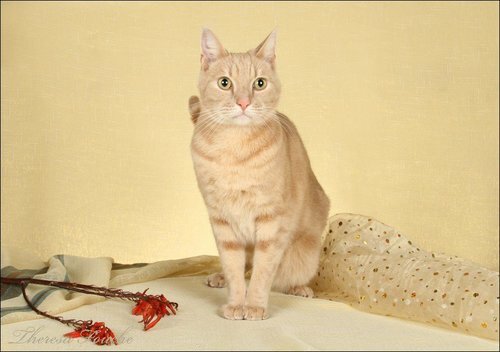 He has never had professional pics taken so I didn't know how he would behave but he surprised me and was an absolute star! 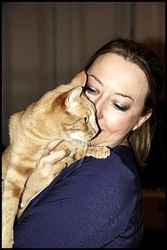 Thanks Theresa for your patience. 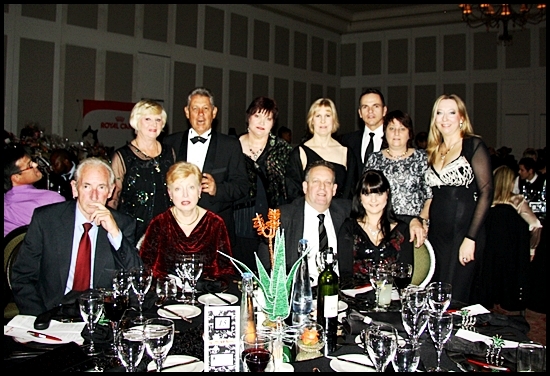 Ethan came 3rd among really beautiful other domestics and I was very proud to accept his award and prize at the gala dinner that evening. 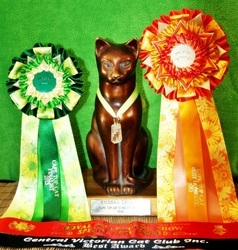 Thank you to all his judges - SACC All Breeds Judge Jan van Rooyen, Australian ACF All Breeds Judge Janis Christison, Spanish TICA & WCF All Breeds Judge Eduard Borras and SACC Speciality Judge Veronica Knight. A big thank you to the Eastern Cape Cat Club Committee for putting on another successful COTY event. 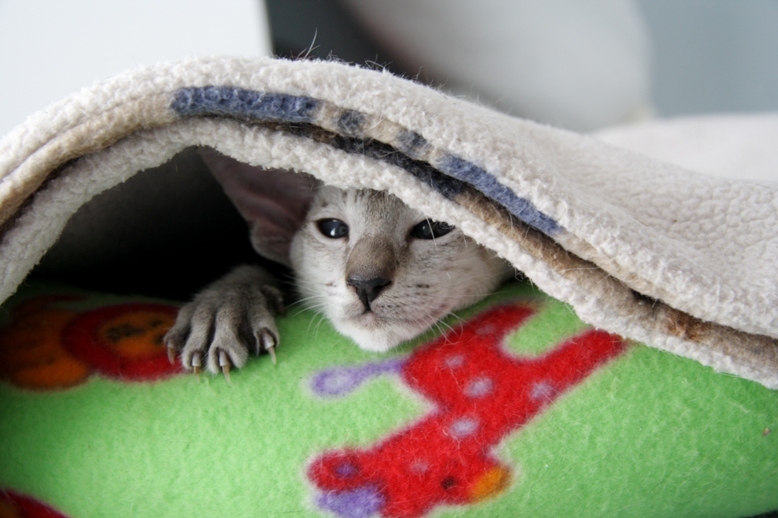 Thanks to Royal Canin for the food, blanket and show cage :-) Thanks to Charlene Du Toit for driving up with me and helping me with everything. 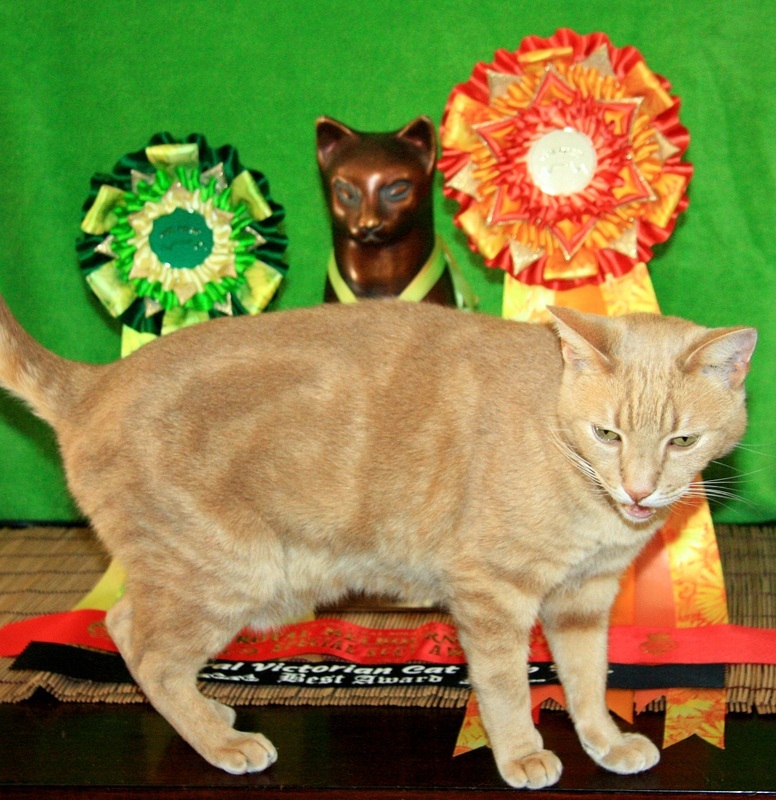 "Master" Ethan was judged Best Domestic Adult and then went on to win Overall Best Domestic on the All Breeds Cat Club Show on 6 July. 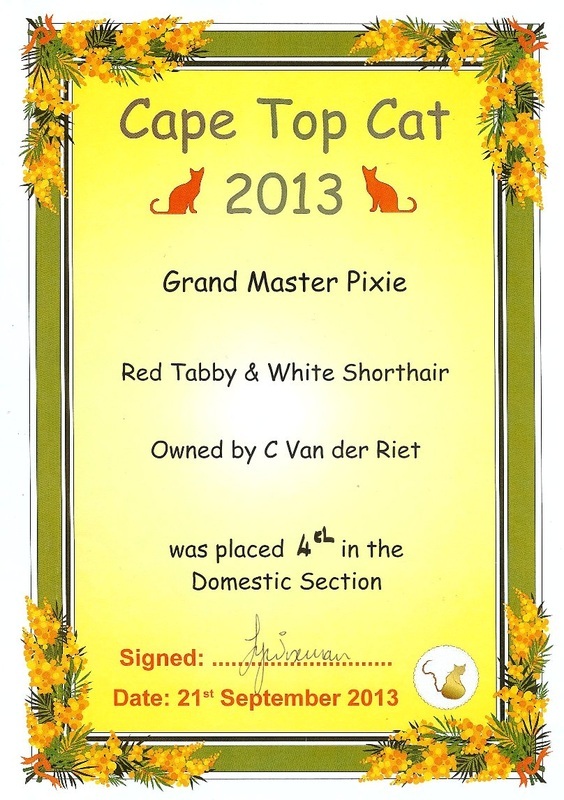 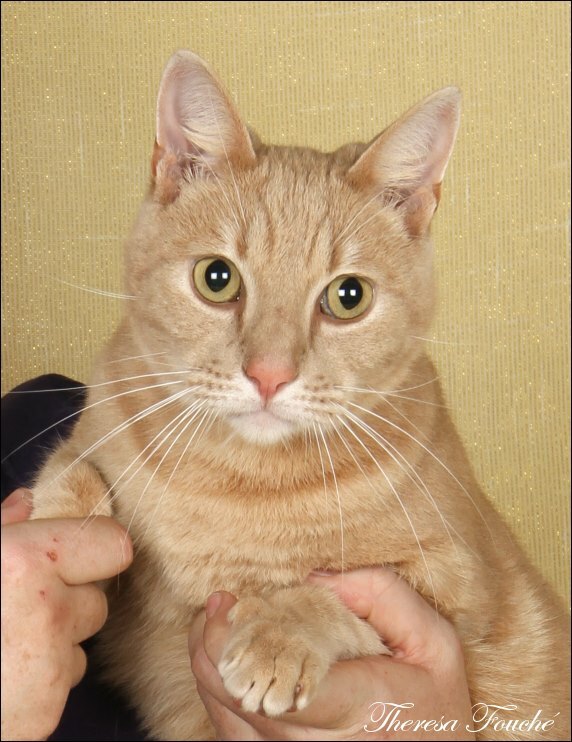 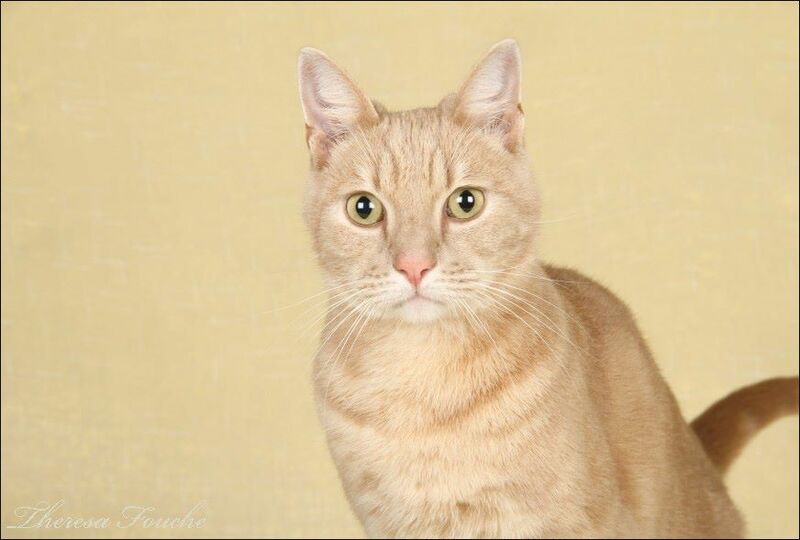 Ethan overtook his "sister" Pixie to qualify as Western Cape Cat of the Year Domestic Qualifier for 2013. 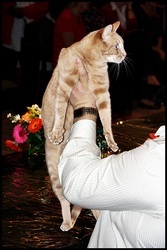 Had a great time stewarding for international FIFE judge Martti Peltonen (Sweden) at The BIG Cat Club Show. 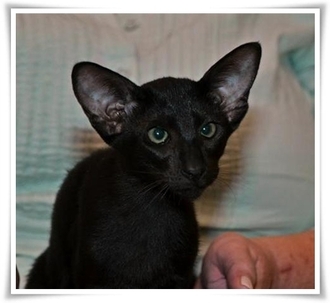 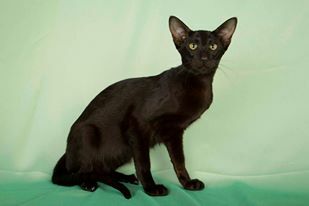 Thanks to Martti for nominating Mai-Thai's Black Swan and Koosje van Tutte's Die Kaapse OORkapi of Mai-Thai (Imp) and Charlene Du Toit's "Robbie" Mai-Thai's Take That in his top 5 Sia/Ori kittens on show and for nominating Mamba (Sup Ch Xtreme Dream Sultan Chan *SK of Mai-Thai (Imp) NW RQ) for Best on Show. Mamba also won the judge-off for Best Oriental on Show narrowly beating his son "Robbie" :-) What an honour to spend the day with a fellow Sia/Ori breeder! I learnt alot! 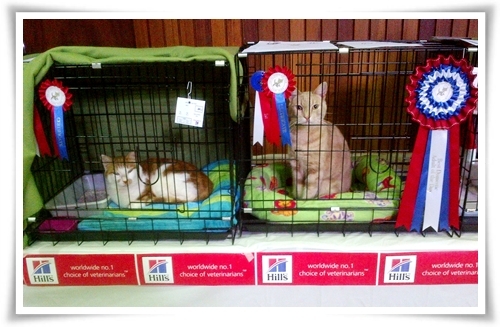 A BIG Thanks also to Domestic Judge Pauline Nel for awarding Certificates to Pixie and Ethan! 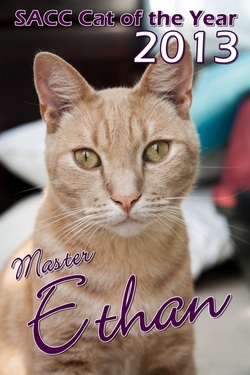 They are both now Masters. So proud! 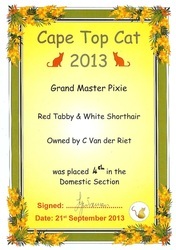 At 8 1/2 years old and only her second show "Pixie" won Best Domestic Adult and Best Domestic on Show at the SAASA show in Durbanville. 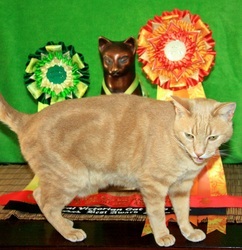 She also gained her second Master Certificate and a 1st placing. 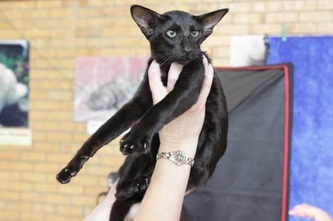 Mai-Thai's Born to be Wild (owned by Carol Winder) won Best Oriental Kitten on show and was Best on Show Kitten Qualifier. Congratulations Carol! 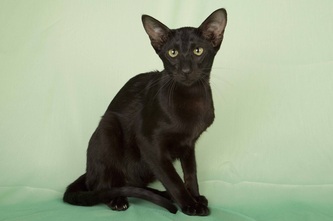 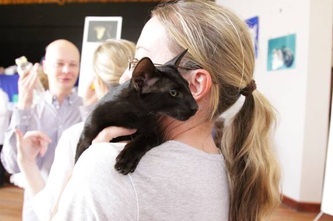 Koosje van Tutte's OORkapi of Mai-Thai (Imp) and Mai-Thai's Black Swan both qualified as Best on Show Kitten Qualifiers at the All Breeds Cat Club show in Kenridge, Durbanville. 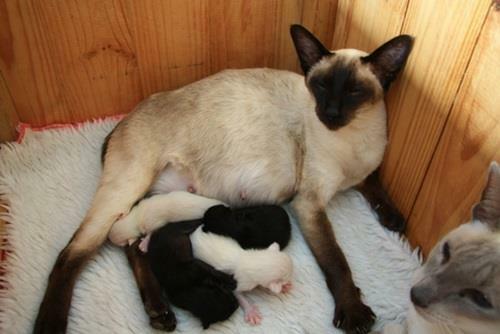 Kapie and Swan were the only two Siamese/Oriental kittens nominated out of 8 Siamese/Oriental kittens on show. 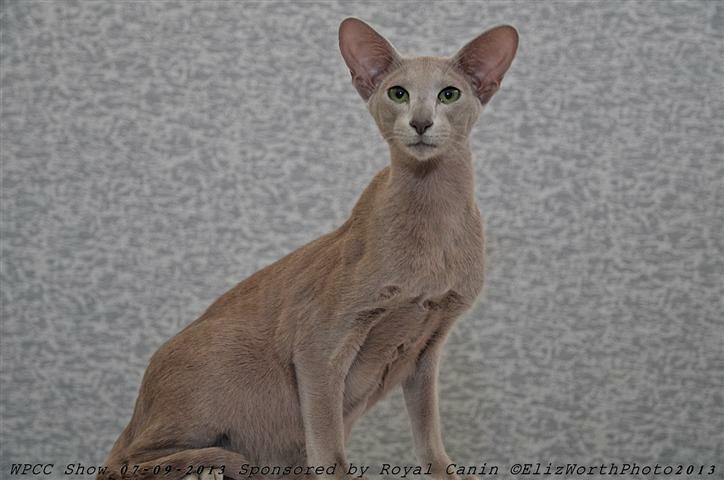 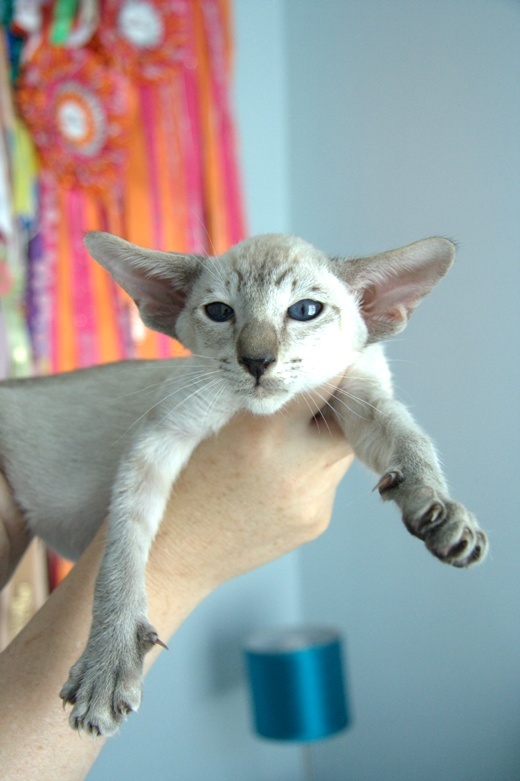 Swan was also Best Oriental Kitten & Best Oriental on show. 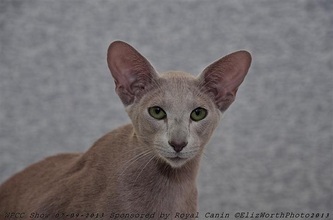 SUPER proud of my Mai-Thai babies :-) Well done also to Carol Winder and "Geena" aka Mai-Thai's Born To Be Wild and Charlene Du Toit and "Robbie" aka Mai-Thai's Take That for representing the Oriental breed on show. 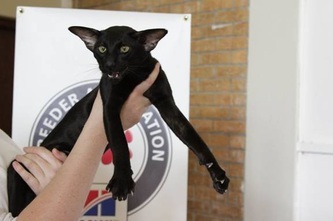 You did Mai-Thai PROUD!!!!! 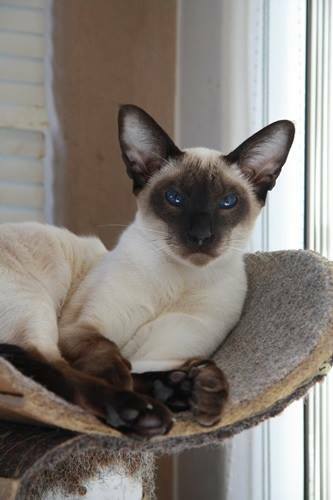 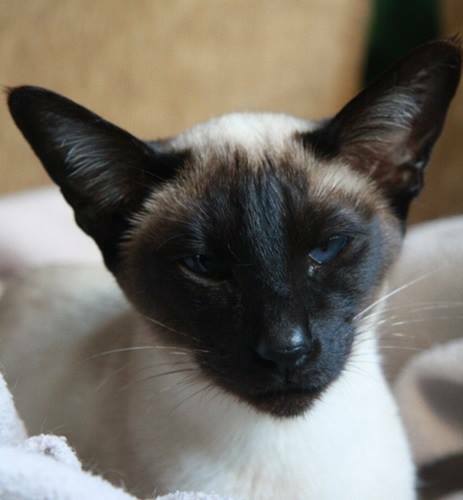 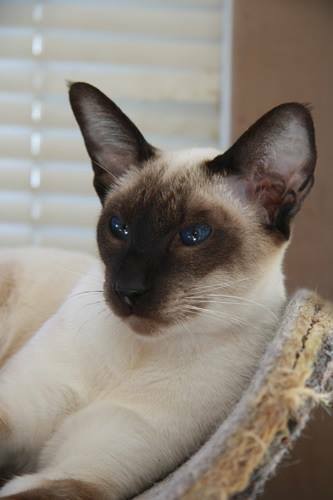 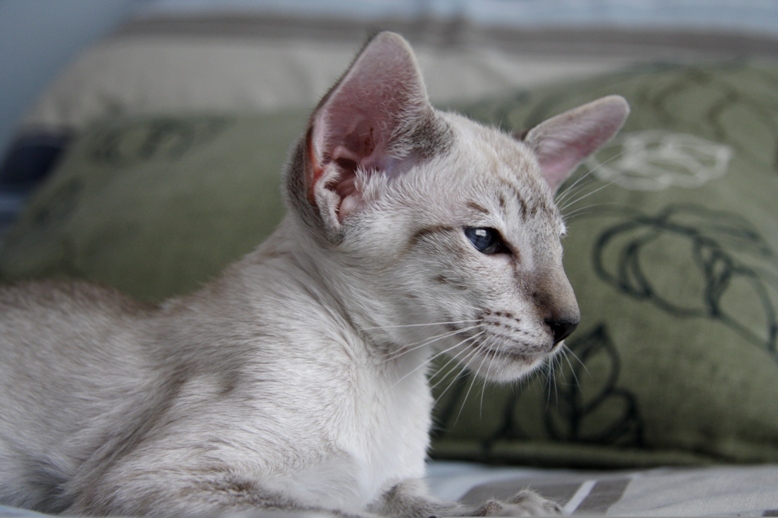 Mai-Thai Siamese & Orientals is very happy to announce the arrival of our new stud from Koos Hendriks - Koosje van Tutte's Die Kaapse OORkapi (Seal Tabby Point Siamese male) - from The Netherlands. 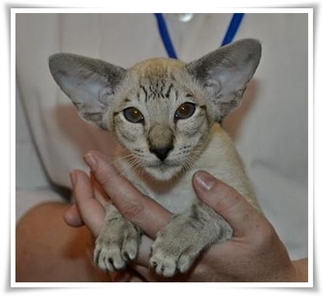 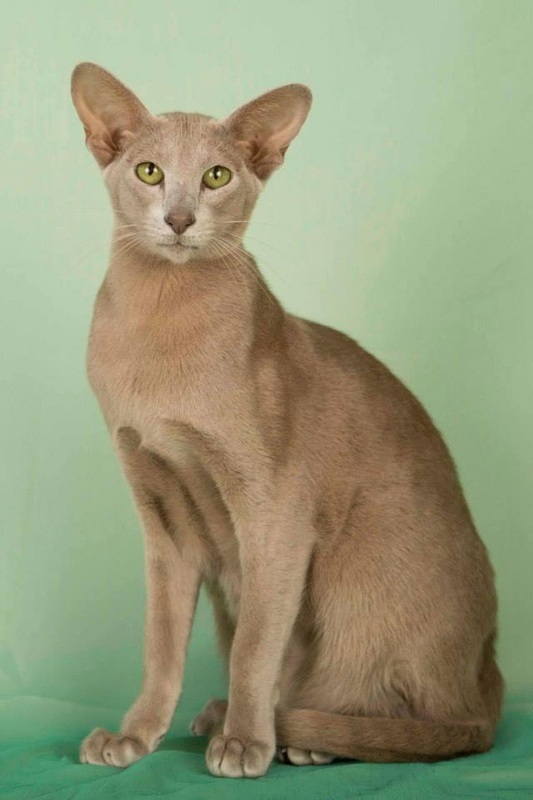 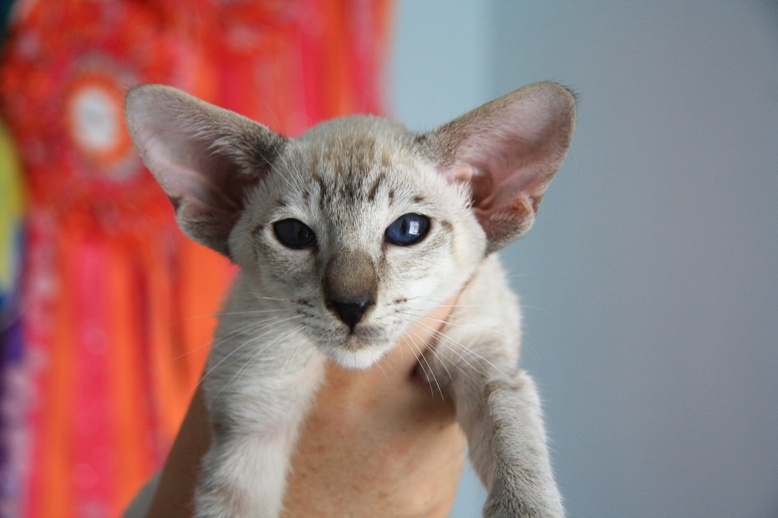 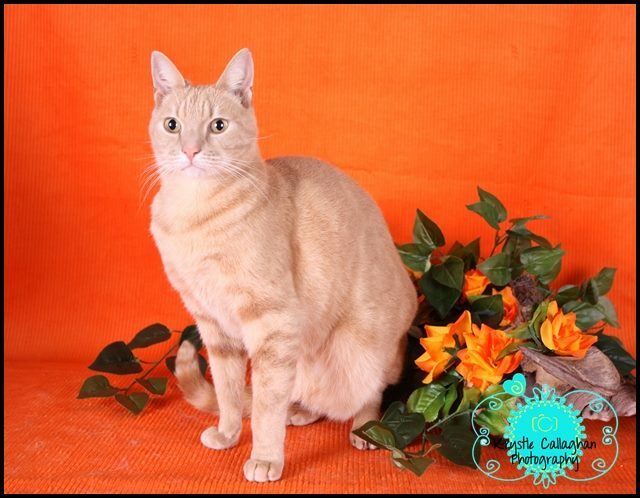 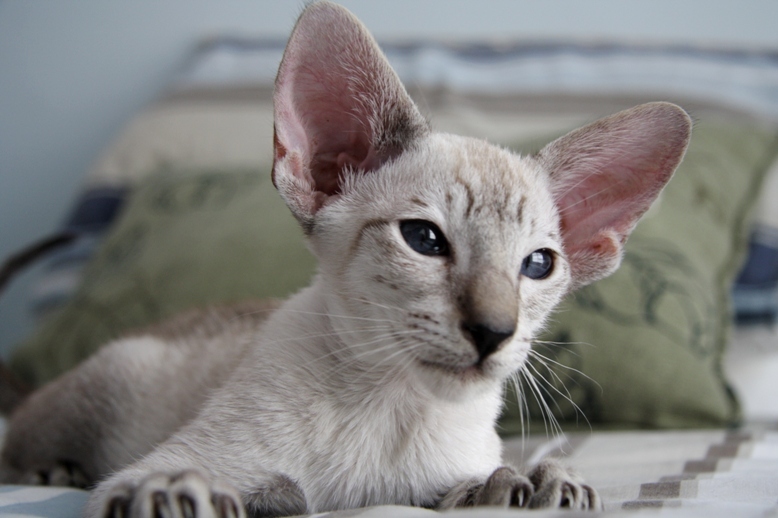 We are very thankful to Koos for letting us have another stud from his cattery and look forward to using him in our Tabby Point Siamese & Spotted Tabby Oriental breeding programmes. "OORkapi" has a super temperament and is a real "Energiser Bunny"! 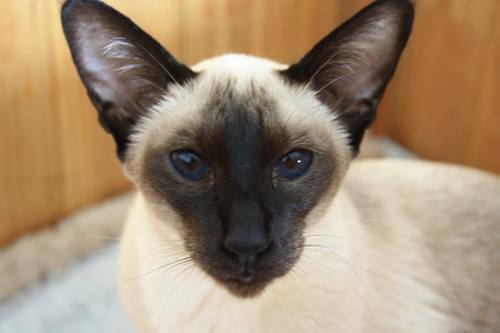 He purrs non-stop and is very demanding of attention. 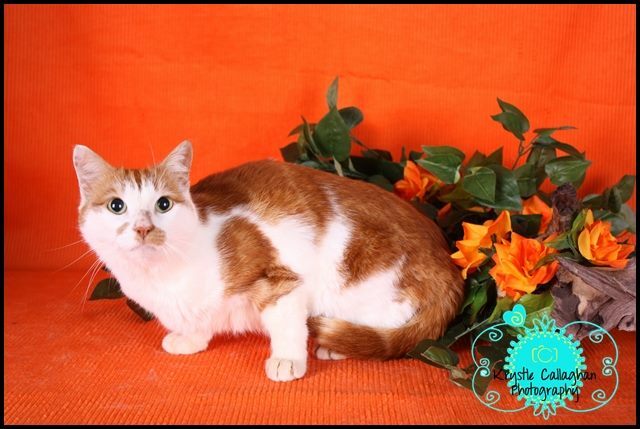 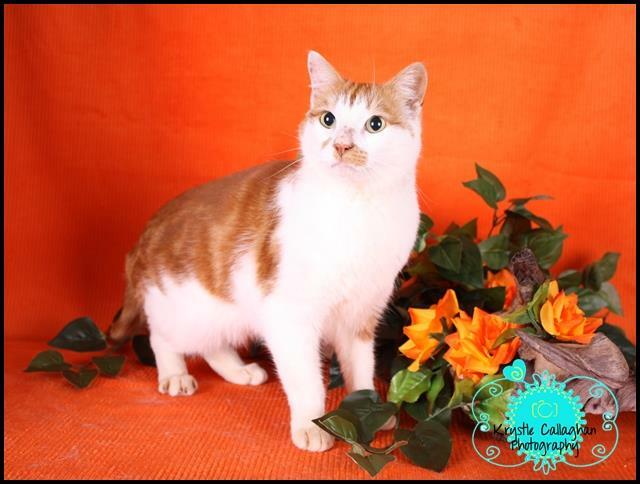 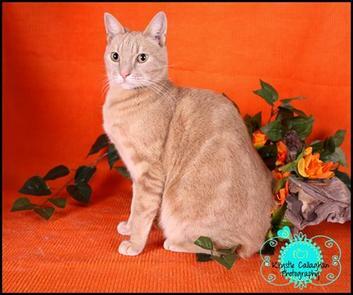 He is being kept in isolation since his arrival and will be introduced to the rest of the Mai-Thai cats in due course.